Published: April 29, 2016 at 12:16 a.m. Updated: April 29, 2016 at 12:41 a.m.
Jerry Jones wanted to get a backup quarterback and successor for Tony Romo on Thursday night, but couldn't close the deal. NFL Media Insider Ian Rapoport reported the Dallas Cowboys tried to trade back into the first round to draft Paxton Lynch, but couldn't get it done. Jones later confirmed that the team tried to get the former Memphis quarterback. The Denver Broncos swooped in and snagged Lynch in a trade with the Seattle Seahawks at the No. 26 overall pick. John Elway sent the No. 31 overall pick and a third-round selection (No. 94) to Seattle to snag his signal-caller. Dallas used its No. 4 overall pick on running back Ezekiel Elliott. With Romo being 36, the Cowboys need to find a quarterback of the future as well as a backup of the present. Lynch is viewed as a quarterback who has the tools to be a top-end NFL passer, but might need a year or two of grooming. Dallas must now turn to Friday to possibly plug its glaring hole at backup quarterback. 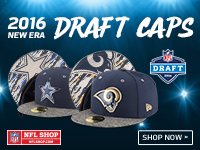 The Cowboys own the third pick in the second round (No. 34 overall) as well as a third-round selection (No. 67 overall). Quarterbacks such as Connor Cook, Christian Hackenberg or Dak Prescott could be tapped by Jones and Co. on Friday, if Dallas again eschews adding an impact player to its defensive line.